Do Symptoms of Depression Interact with Substance Use to Affect HIV Continuum of Care Outcomes? Few studies examine how depression and substance use interact to affect HIV control. 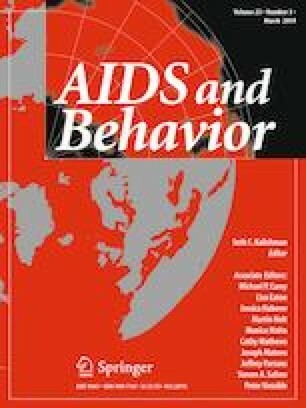 In 14,380 persons with HIV (PWH), we used logistic regression and generalized estimating equations to evaluate how symptoms of depression interact with alcohol, cocaine, opioid, and methamphetamine use to affect subsequent retention in care, maintaining an active prescription for ART, and consistent virologic suppression. Among PWH with no or mild depressive symptoms, heavy alcohol use had no association with virologic suppression (OR 1.00 [0.95–1.06]); among those with moderate or severe symptoms, it was associated with reduced viral suppression (OR 0.80 [0.74–0.87]). We found no interactions with heavy alcohol use on retention in care or maintaining ART prescription or with other substances for any outcome. These results highlight the importance of treating moderate or severe depression in PWH, especially with comorbid heavy alcohol use, and support multifaceted interventions targeting alcohol use and depression. This work was supported by two NIAAA Research Grants (U01 AA020793, U24 AA020801). Anthony T. Fojo, Catherine R. Lesko, Keri L. Calkins, Richard D. Moore, Mary E. McCaul, Heidi E. Hutton, William C. Mathews, Heidi Crane, Karen Cropsey, Michael J. Mugavero, Kenneth Mayer, Brian W. Pence, Bryan Lau, and Geetanjali Chander declares that they have no conflict of interest. Katerina Christopoulos has been scientific advisory board member for Roche Pharmaceuticals and a community advisory board member for Gilead Sciences Inc.
National Institute on Drug Abuse (NIDA). Clinician’s Screening Tool for Drug Use in General Medical Settings; 2010. https://www.drugabuse.gov/nmassist/.